The Social Republic of Vietnam comprises of three different areas. Then, the best time to visit Vietnam somehow will depend on the areas you like to go.The North, from Chinese border to the city of Hue, includes the capital of Hanoi, the mountainous area by the Chinese border and the famous city of Sapa, as well as Halong Bay on the eastern coast. The center, stretching from Hue to the city of Nha Trang comprises the imperial, cultural city of Hue, and the beach cities of Danang and Hoian. The South counts numerous beach cities such as Nha Trang, Phan Thiet, Mui Ne, but also the islands of Phu Quoc and Con Dao, as well as the mangroves of Mekong Delta and the busy city of Saigon (Ho Chi Minh City). Those three areas have very distinctive climates and while sometimes the weather can be freezing in the mountainous areas near the Chinese border, the beaches of Phu Quoc, in the South can be very sunny. Hence, if you come to Vietnam for a beach holiday, anytime of the year is absolutely fine. Indeed, we can divide the beach areas of Vietnam into four areas. The Center, and the cities of Hue, Danang and Hoian (those two last cities being on the coast) is sunny from December to May, and the month of July and August are usually warmer and more humid as well. The area further South to those cities and the beach cities of Nha Trang and the less frequented Quy Nhon have a perfect weather for a tan from January to September, with a higher humidity rate from may to September. Further South, the coastline with the cities of Phan Thiet and Mui Ne, Vung tau and Ho Tram, know a pleasant weather, perfect for a beach vacation in Vietnam from November to April. Finally, the two most beautiful islands of Vietnam, Con Dao and Phu Quoc, have a very specific climate, and most probably the most beautiful coastline scenery in the area, and the weather is perfect from November to June. In general, the best time to visit Vietnam is from October to April and is the high-season in Vietnam. The reason why the months of October, November, December, January, February, March and April are the best months to visit Vietnam is because those months correspond to the dry season in South Vietnam and the end of the wet and extremely warm summer of North Vietnam. This period is then considered the best time to travel to Vietnam because travelers have high chances of crossing the whole country and have a nice weather everywhere. The “low season”, also called the “green season” is now becoming more and more popular for tourism to Vietnam since the prices to visit the country are generally lower than during the high season, the touristic attractions are less crowded and as the country is divided into three regions with distinctive climates, if you choose the right destination at the right time, you will definitely have a beautiful experience in Vietnam (please refer to the weather section of our website for more information on the weather). The best time to visit or the best travel interest & destinations in Vietnam? But visiting Vietnam is not only about having a sunny weather and beach holidays. If you are interested in admiring the stunning green terrace rice fields in North Vietnam, the best time to visit the country is from May to July. Also, some major cultural events happen in Vietnam, such as the Tet or Lunar New Year, Vietnamese celebration of the new year in late January or February, depending on the year, or also the Festival of Hue, usually in April, hosting numerous art and traditional performances. To conclude, there is no best time to visit Vietnam, but there is a best travel interest and destination to visit Vietnam for every month! 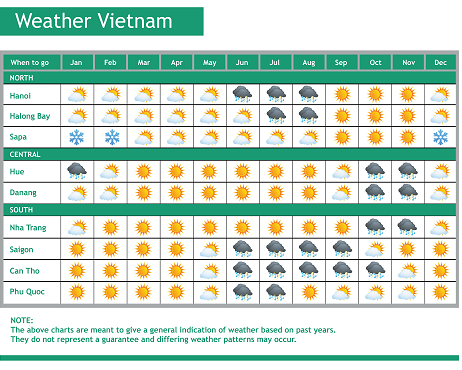 For more information on Vietnam weather, please click here!